A place for reviews of books that Preteens, Teens, and Young Adults might be interested in. A Wrinkle in Time by Madeleine L’Engle is a classic Newbery Award winner which is one of those books “everybody” is supposed to have read, but for some reason I never got around to reading it. My sister had read it, and I kind of knew the concept of a “wrinkle in time,” which is basically what the TV show Quantum Leap was about. Anyway, I read it last week, and I thought it was a wonderful book! It deals with traveling through space and different dimensions, so if you’re into that kind of thing like I am, be sure to read this book. The characters are very intriguing, and at the end the protagonist, Meg, has to save her little brother from a strange being that has an entire planet under his control. It is a very complicated plot that will either draw you in so you can’t put it down, or confuse you so much you don’t get farther than the first chapter. It’s up to you! Charles and Emma: The Darwins’ Leap of Faith by Deborah Heiligman looks beyond Charles Darwin’s impact on evolutionary theory and focuses more on who he was as a man. It is well researched and based on several personal journals, so I believe it is very accurate. I still don’t believe Darwin came to the right conclusions in his writings, but I grew to respect him as a person. He had a wonderful relationship with his family and was a great husband and father. The book was really well written and captured my attention, and I really came to care about the family. The book doesn’t try to influence whether or not Darwinism is true—it focuses on the people. I would highly recommend it to anyone! 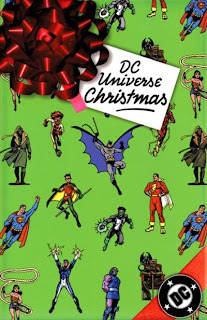 This is a compilation of 17 Christmas-themed comics published by DC Comics in the 1940s, '60s, '70s, '80s, and '90s. They mostly feature well-known DC Comics superheroes, but there are some non-superhero comics included as well. They are light and fun stories--even the story with Darkseid is funny. In a world of superheroes like Superman, Batman, and the Flash, why would a man who can travel the world at superspeed and deliver toys secretly seem so unlikely? This graphic novel is about a girl named Jane who was injured in a bomb explosion in the city so her family moved to the suburbs. She missed the city and didn’t know with whom she wanted to fit in at her new school. She found three other girls named Jane and together they formed P.L.A.I.N. (People Loving Art In Neighborhoods). Many in the neighborhood called what they did vandalism, but they wanted people to see the world as a beautiful place and not a place to be afraid of. This is an enjoyable story and a good graphic novel. It doesn’t have any superheroes, but it deals with real things and most readers could probably identify with it. A NIFTY POSTER FOR YOUR ROOM! The book reviews do not have to be very long, but they must be in your own words and use complete sentences and correct spelling and grammar. Show me the book review, and if I see that you put some thought into it, you will win your prize, first come first choice, while they last. You might even get your review posted on this blog! A graphic novel by Michael Green and Mike Johnson, illustrated by Shane Davis, Superman/Batman: Search for Kryptonite is a fun adventure with these two very different yet compatible superheroes. A second rate villain gets a lucky break and defeats Superman because there happened to be some kryptonite lying around. Batman was able to call the Flash who came to the rescue, but Superman was annoyed by how vulnerable he is to kryptonite. He and Batman teamed up to find and destroy all the kryptonite on Earth, but it turned out there was a lot more than they thought there was! I would recommend this book to any fan of Batman and Superman. Just a couple teasers: there is a monster who is version of Doomsday combined with kryptonite, and just try to guess who came up with that one! Also, it's possible that Lana Lang could turn out to be a villain, but I'll leave you hanging so you read the book!